Move over, Susan Boyle. You’ve got competition. She’s 10 years old, she’s beautiful and, boy, can she sing. In Tuesday’s episode of “America’s Got Talent,” Pennsylvania native Jackie Evancho knocked the audience off its feet with her rendition of the Puccini aria “O Mio Babbino Caro.” The judges could not believe their ears: During an interview with Jackie after she was finished, one of the judges asked her to re-sing a note — just to be sure they really were listening to a 10-year-old and not some offstage diva. 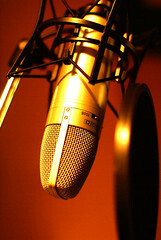 Image: Vocal Microphone by Magic Photography via Flickr Under A Creative Commons License. For those who are interested, I’m also over on Politics Daily today talking about the latest round of controversy surrounding the Lockberie Bomber’s humanitarian release from a Scottish prison last year. I hope that she is “handled” with kid gloves…and care. I sang amazingly well and maturely as a teenager but lost my ability to sing with tumors on my voice box in my early 40s. It is hard to find something else that makes you “sing” and feel that way. Julie Andrews was a child star who supported her family and lost her singing voice and has gone on to be a beautiful human being….she gives me hope for the next generations? I also love to sing, Patricia. Sorry that you cannot, tho so glad you are stil with us! the latest childhood star is “monet boy”-have you heard of him? google it. amazing! I was blown away by this little girl. She’s beautiful with a voice that is a rare gift from God. I hope she does phenomenally well and that her parents keep her grounded and as normal as possible. me too. have you heard about mini-monet? another prodigy, this time in art: http://www.digitaljournal.com/article/296129. check him out! I did see the story about him – absolutely amazing. I cannot afford the art of an 8 year old! I wish him well – although I think his talent is going to take care of him. Good luck to the little girl with the big voice — may it work well for her. As to the Lockerbie bomber, those who wish to believe there was evil plotting behind his release, will. Those who wish to believe otherwise, likewise. Unhappily neither wish will resurrect the dead.